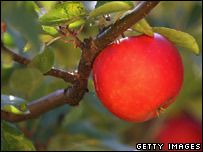 Volunteers are being asked to drink a pint of cider to determine whether they receive the health benefits of apples. Researchers, funded by the National Association of Cider Makers, have found high levels of phenolics in English Cider Apples. These antioxidants are said to be linked to protection against stroke, heart disease and cancer. The University of Glasgow said it hoped their research would improve manufacturing techniques. Their research so far has shown some varieties of apple have higher levels of phenolics than others. It is hoped manufacturers will choose apples with high levels of phenolics. The next stage aims to analyse how humans absorb phenolics. The research is also funded by the Biotechnology and Biological Science Research Council. Professor Nigel Brown, director of science, said: "The exciting research shows how scientists and industry can work together to improve manufacturing techniques, not just for economic gain, but as in this instance, to bring about potential health benefits to the public too." A spokeswoman for Alcohol Focus Scotland said: "No matter what potential health benefits are discovered, the fact remains alcohol itself is a drug which has the potential to cause health and social harm."